On Thursday 10 Jan 2013 a group of local performers came together in support of Mimi Le Yu whom has recently found herself in need to help. The night consisted of an all star ensemble that featured fire performers Scarlett Sinferno, Cynder Ella, and Chad Wilson. Burlesque by Deidre Doll, Little Bo Peepshow, Sindee HooHoo, Moxie Malicious, Bam Bam Bambi, Rayna Skye, Alley Gorey, and Whiskey Kiss. There also was polesque performed by Missy Fit. 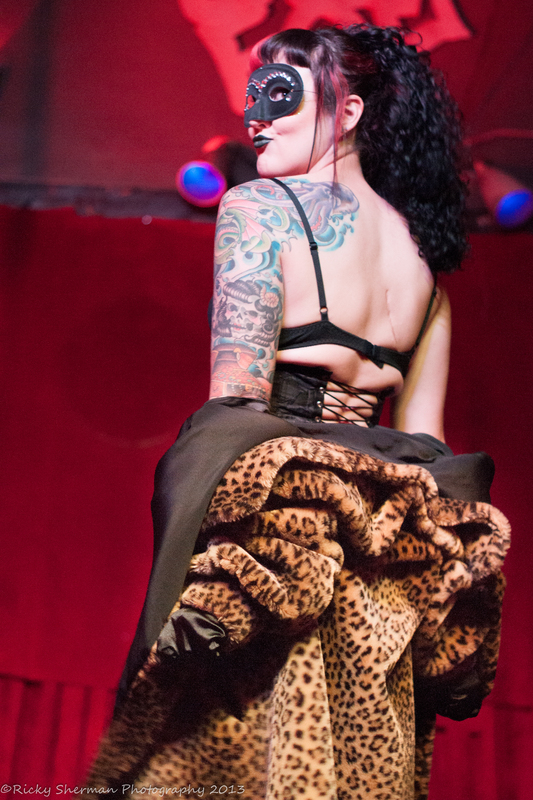 The audience was also treated to a performance by the human pincushion Priscila Pincushion and music by Brian Lee Bauer, DJ Skeletal, and Schmeil Diamond. The show was hosted by MC Jack Deuce. 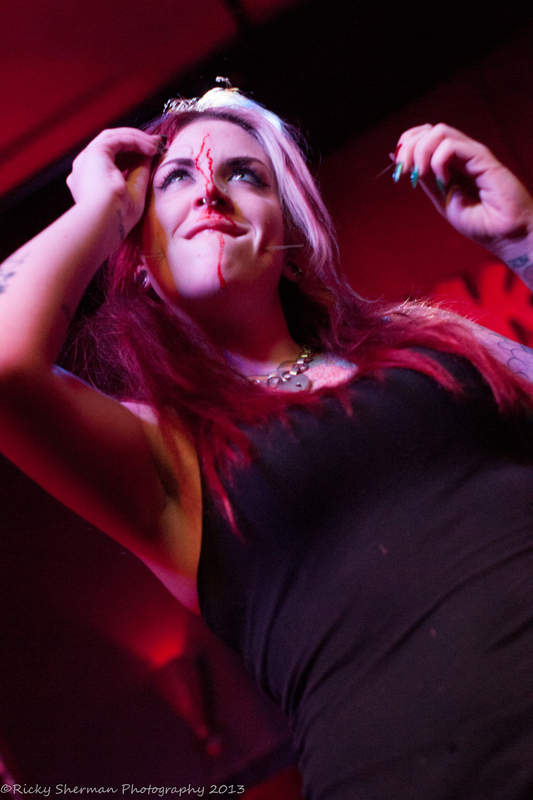 ©Ricky Sherman Photography 2013 – Deirdre Doll performing to Mood Indigo at The Crack Fox in St. Louis, Mo. For Those those not familiar with the Burlesque scene there is more to it than standing on stage and ripping ones clothes off. A good burlesque performer will spend hours if not days finding the perfect wardrobe piece, song, and moves to make it as seductive as possible. The level of creativity that can be found in a single performance can make your typical musician appear quite frankly, LAZY. Good burlesque in of itself is an art! For myself, one of the greatest aspects of Burlesque is how a song out of popular culture can magically be transformed into reality through a well choreographed routine. On this particular January night one specific highlight was performer Rayna Skye singing The White Stripes “Seven Nation Army” while in a military uniform. Seen this done this before? I think not she actually sang the song doing justice to the original as she threw in a burlesque twist. Another standout performance was by Alley Gorey. Performing to Nine Inch Nails song “Closer.” This song in itself invokes sexual energy and endearment from any NIN fan. So it should not be a surprise that in St. Louis in an Goth, Festish friendly, Alternative rock kinda bar that the patrons would relish a great performance to an amazing song. Another standout performance was by Priscilla Pincushion. As you can imagine as a human pincushion there were needles and blood involved. This is an act that is not for the squeamish at heart. Needle after needle she punctures skin and cartilage in the most heinous way imaginable invoking memories of performing self piercings or receiving a shot as a child. If the memories of pain don’t flood through you perhaps the sight of blood may put you over the top and cause your to squirm like a pet realizing it is at a vet. In the end it is a sight to behold and needs to be seen at least once to just to say you have. This is better than anything you’ll see on TV. At events end few could find any qualms with how the nights events transpired. Everyone was happy to be there in support of a friend/fellow performer and to have a chance to see the local favorites perform something new. This was in my opinion another quality event that hopefully raised enough to make a difference in one young ladies life. I was there and yes it was an amazing show, I hadn’t seen one this big outside of a major Randy Dandies production. I also got a chance to enjoy Priscilla’s bartending skills as well as her pincushion act. I had no idea it was going to be a benefit for Mimi but once I found out I was even more glad to have been there.